The designation will accelerate the massive operational scale-up now underway to assist victims of last week’s Category 4 cyclone and subsequent large-scale flooding that claimed countless lives and displaced at least 600,000 people. It follows the government’s declaration earlier this week of a national emergency – the country’s first – and request for international assistance. 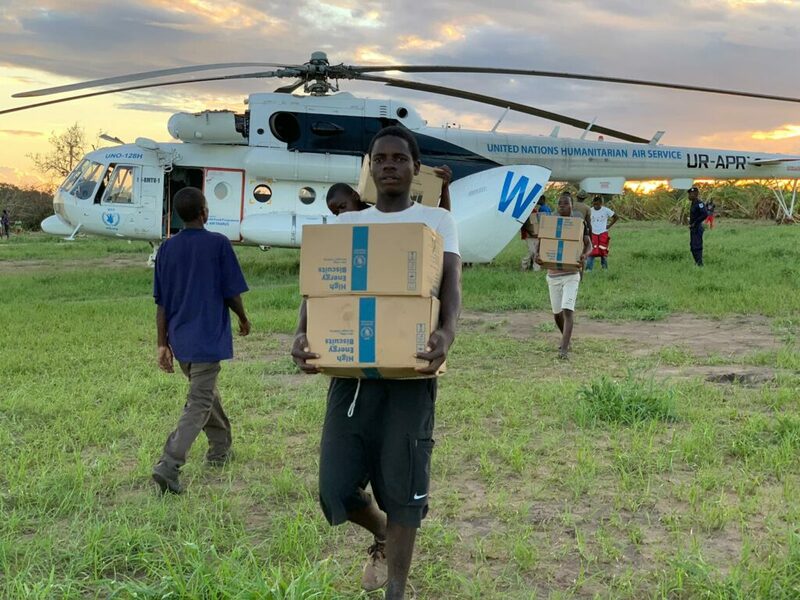 That triggered the activation of global, multi-agency ”clusters” to coordinate relief efforts on food security, logistics and emergency telecommunications (led or co-led by WFP) as well as on water and sanitation. Satellite imagery shows numerous floodplains, including an “inland ocean” 125 km by 25 km – the size of Luxembourg – where water levels surged as high as 11 metres, submerging almost everything in their path. An MI-8 transport helicopter contracted by the WFP-run United Nations Humanitarian Air Service (UNHAS) continued to airdrop food – including WFP high-energy biscuits (HEBs) and micronutrient-rich peanut paste used to prevent and treat malnutrition as well as tents, medicines and other essentials for stranded communities outside Beira.